buy two Quiz-Quiz-Trade books and get the third FREE! SAVE $24! Be sure to mention code CSPEC189 to receive your discount. 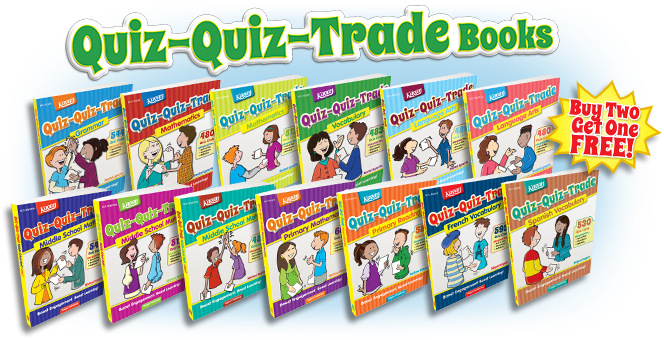 Choose from any of these Quiz-Quiz-Trade books. Instructions: Select 3 books, then click the Click to Buy button below. • Orders accepted online, over the phone, or with a Purchase Order. • May not be combined with other promotions or offers. • Books also available as downloadable PDF eBooks. Call to order. Turn content mastery into a fun and energizing learning game. Students each receive a Mix-N-Match card. They "Mix" in the room, repeatedly quizzing classmates and trading cards. Your students will have so much fun playing Mix-N-Match, they'll hardly realize how much they're learning.